If you are using multiple instances of XBMC throughout your house one thing you’ll definitely want to consider is setting up a shared MySQL database that can be used to retain data about the media you have. A good example of this is saving the status of where you left off in a video. If all of your XBMC instances don’t share a centralized data system you won’t be able to stop a video in one room and pick up where you left off in another. 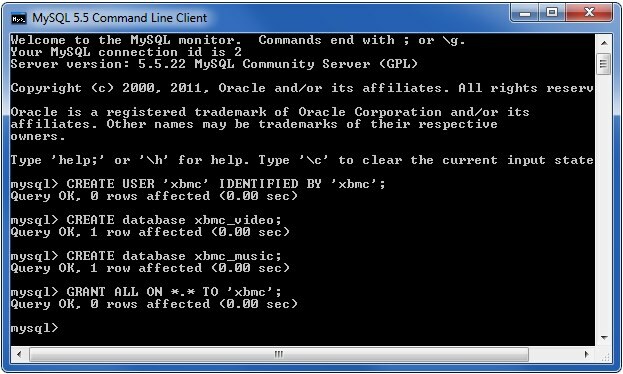 A MySQL database gives each XBMC a way to share that data. You can even step beyond just sharing a database and share other files as well. This can include thumbnails of the media you have in your library, add-on configurations, media sources, and more. When all of this is set up it will almost be like having a centralized XBMC server. All you have to do is update the <host> IP address to point to the computer running your MySQL instance, restart XBMC, and it should start using the databases you created. If you’re still having troubles you can head on over to the XBMC Wiki to take a look at some of their OS-specific tips. XBMC also has what they refer to as a special protocol that will let you configure local files to be shared among multiple instances thanks to path substitution. What that means is that you can tell XBMC to redirect any requests to specific files/folders to a remote location on another computer. Below you can see I’m redirecting all kinds of locations including thumbnails used for movies/TV shows, playlists, addon configuration data, all of my media sources, and more. If you don’t see a file named advancedsettings.xml go ahead and create it, but if it does exist just open it up. You’ll then want to add the lines below and update the “to” node of each substitution to match how your system is set up. The “smb” refers to the Samba protocol I’m using to connect to the share, the “192.168.1.10” is the IP address of the computer hosting the files, and the “XBMC” is the share name on that server. Once you have this all in place just restart XBMC for the changes to take effect, and you should see it start using those locations for storing the files. Our introduction provides some of the deciding factors for switching from Windows Media Center to XBMC. Our extensive guide on the hardware we chose for our home theater PCs (HTPCs), the cost, and some tips on choosing the hardware for your own HTPC. A helpful list of tips to optimize the performance of Windows 7 so that the system is able to offer as many resources to XBMC as it can. If you want your HTPC to operate like a set-top box you’ll definitely want to get a remote control configured, and for me this was a critical step so that I wouldn’t have to be concerned about less tech-savvy users trying to use my TV. Configuring XBMC to share settings between multiple instances means you’ll be able to stop a show in one room, and seamlessly pick up where you left off in another room. If XBMC doesn’t fit your TV screen perfectly there are a couple of steps you can take to get it just right. How to tweak the appearance of XBMC so that it looks the way you want it to. Make the backgrounds of your chosen skin/theme a little more interesting by having it flip through artwork from your favorite TV shows and movies. If you’re using the Aeon MQ 3 theme you can have it use dynamic wallpapers that change based on the time of day and current weather conditions. I use a Mac to serve up files to my XBMC instances running on Windows, and so my preferred protocol for sharing files is SMB. This guide explains how you can get a XBMC-compatible version of SMB running on Mac OS X 10.7 Lion. Learn how to add your media to XBMC and turn on the appropriate content scrapers. Trying to troubleshoot buffer issues in XBMC can be quite a pain, and so I lay out some of the most common culprits. Want to see how well your HTPC performs? Throw some of these high bitrate 1080p sample videos at it. Configure some of the settings that you won’t find anywhere in the GUI. Thanks to add-ons you can stream videos from some of your favorite sources including Hulu, Food Network, HGTV, TWiT, and more. Send videos from your iOS device to any XBMC instance with very little configuration. As long as you are on the same network as your XBMC box you can control it from any browser using the built-in web interface, or you can install a Chrome extension to make it even easier. If you own an iPhone or iPad you can enjoy one of the best XBMC remote control experiences I’ve seen, and it will only cost you a few bucks. A recap of all the guides we’ve written as well as useful wiki and forum post from the official XBMC.org site. This is the free and official XBMC remote control iOS app (optimized for both the iPhone and iPad). It will let you easily control all of the XBMC instances in your house as long as they are all on the same network. Learn how you can make XBMC start automatically when Windows 8 boots. Send YouTube videos from your PC to any XBMC instance in a single click. If you’re looking for one of the best and most popular XBMC skins the Aeon MQ 4 is a great choice. Control multiple instances of XBMC without ever having to open an app on your Android device!